What it does: LG has about 70 operating divisions that make household appliances, electronics and telecommunications equipment. Founded: 1990 as Iriscan; in 2000, Iriscan merged with Sensar Inc. to form Iridian. What it does: Iridian researches, develops and markets authentication technologies that are based on iris recognition. EDS is using iris scan technology at Ronald Reagan Washington National Airport and Boston Logan International Airport. The cancellation of LG Electronic Inc.'s license for iris scan technology will not disrupt the Transportation Security Administration's Registered Traveler pilot program, LG and TSA officials said. LG is providing the technology to systems integrator EDS Corp. under a license from patent holder Iridian Technologies Inc. at two of Registered Traveler's five airport test sites. The pilot programs are testing the use of biometric iris and fingerprint scans to improve the security screening process at U.S. airports. Although Iridian terminated its license agreement with LG in August, LG said it will continue to sell and maintain its IrisAccess products, which are based on Iridian technology, until the dispute is resolved. "We don't expect [the dispute] to impact EDS' performance on that project at all because of an alleged transaction by Iridian," said David Johnson, vice president of marketing at LG's iris technology division. Johnson said that before Iridian canceled the license agreement, LG had taken steps to address the conflict through a dispute resolution mechanism in their agreement. TSA spokesman Darrin Kayser also said the dispute would not disrupt the Registered Traveler pilot program. "Anything involving the contractor or the way they run their business or the way they do business, we leave to the contractor," he said. "We have a contract with [EDS] to provide the product, and they are providing it." EDS spokesman Kevin Clarke declined to comment specifically on the LG-Iridian dispute, but said EDS was taking appropriate steps to continue providing quality services to its customers. EDS is using the iris scan technology at Ronald Reagan Washington National Airport and Boston Logan International Airport. EDS received a $1.2 million contract for the work. Unisys Corp. is running the three other Registered Traveler pilots at Minneapolis-St. Paul International Airport, George Bush Houston Intercontinental Airport and Los Angeles International Airport. The company's contract is worth $2.5 million. The company uses Panasonic iris recognition cameras at the three airports. The Registered Traveler pilot program would not be interrupted by the license agreement cancellation, said Jerry Ruddle, an Iridian vice president. But Ruddle raised the question of whether, going forward, the program would include with the core iris scan technology only technology in good standing. "EDS is an important integrator in the federal market space, and we'll do whatever we can to ensure we have a product to take to the marketplace," Ruddle said. The Moorestown, N.J., company holds several patents on iris recognition technologies used for identity authentication. "Iridian's intention is to have the best possible relationship with all our partners," Ruddle said. "When we discuss this with EDS, I'm sure we'll come to some understanding to clarify it." He declined to indicate when Iridian would discuss the matter with EDS. LG obtained a license for the iris scan technology from Iridian's predecessor, IriScan Inc. in 1997. IriScan bought a company called Sensar Inc. in 2000 and changed its name to Iridian. Although Iridian changed its focus to software, LG retained its license to the iris scan technology and, according to LG officials, enhanced its performance and value. LG also provides the IrisAccess 3000, its trademarked iris scan product, for a project conducted at Canadian airports by the Canadian Airport Transport Security Authority. Iridian terminated LG's license agreement for the iris scan technology Aug. 23. Both Iridian and LG declined to discuss the specifics of the dispute, citing confidentiality clauses under a non-disclosure agreement. Four days later, Iridian issued a statement asserting that "LG is no longer licensed to use, sell or distribute Iridian's technology and intellectual property in any way, including in LG's iris cameras and software." LG countered Aug. 30 that steps were being taken to resolve the disagreement through mutually agreed upon dispute resolution procedures, which the company had initiated Aug. 20 ? before the announced termination. LG also filed a lawsuit against Iridian in U.S. District Court in Newark, N.J, alleging that Iridian had breached the parties' license agreement and had "not acted in good faith." LG asked the court to declare that its products, including its IrisAccess line, do not infringe upon Iridian-held patents. LG also requested the court to prohibit Iridian from interfering with LG's existing or potential customers or with the company's marketing and sales efforts. Iridian contends that it terminated the license agreement "after lengthy negotiations with LG failed to resolve the parties' dispute." Many federal biometrics test projects, including Registered Traveler, use iris scan technology. 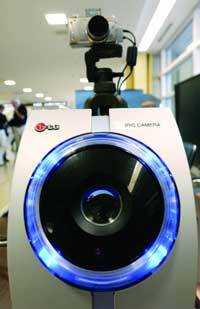 TSA's program uses LG's Iris-Access 3000 enrollment unit. LG's core iris scan technology is licensed from Iridian, whose IrisAccess system is a registered trademark in Korea, Brazil, the Unites States and the European Union. Under standard contracts, the federal government allows contractors to infringe on any patent to carry out their contract work, said Joseph Petrillo, who specializes in government contract law at Petrillo & Powell PLLC in Washington. Patent owners can't sue to stop contract performance. Instead, companies would seek to obtain "reasonable and entire compensation" from the government ? basically a license fee ? and could sue the government in the Court of Federal Claims if they didn't pay, he said. "Usually, the government puts an indemnity clause in the contract, so the contractor has to reimburse the government for what it pays the patent owner," Petrillo said. "In effect, this system amounts to compulsory licensing of patents in government contracts."